You're a cashier at the National Neopian, and it's an extremely busy day! 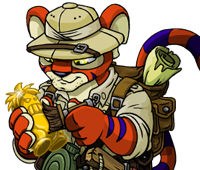 Not only are Neopets coming in by the dozen to deposit money, a nasty band of thieves has decided to come and steal it all. It's your job to work the security system to keep the customers in and the robbers out! To control the security system you must use the keyboard. The keys S, D, F control the three doors to the left of the screen, and the keys J, K, L control the other three. Only press the security system when you see a robber! You'll recognise the bad guys by their wanted posters below. Also, there is a rumour that a new mystery criminal who has recently escaped jail is on the loose. If you don't activate the alarm, the robber will steal half of your Neopoints (the ones in the game, not the ones you have earned)! Also, pressing the alarm for no reason will cost you for unnecessary use of the alarm system (it's expensive to maintain). Lastly, you can press the spacebar to turn 100 NP into a big gold bar. This is useful because robbers can't steal those as they are too heavy. Or they're just lazy. You are about to send feedback on Trouble at the National Neopian. We would appreciate it if you could give the game a rating out of 10, and also tell us any additional comments you may have. Thank you for your feedback on Trouble at the National Neopian.